- Pancake holster style with a forward cant! - Belt slots up to 1.75" belt! - Made for the tool of your choice! *CASE/SHEATH ONLY--BELTS PICTURED ARE NOT INCLUDED! 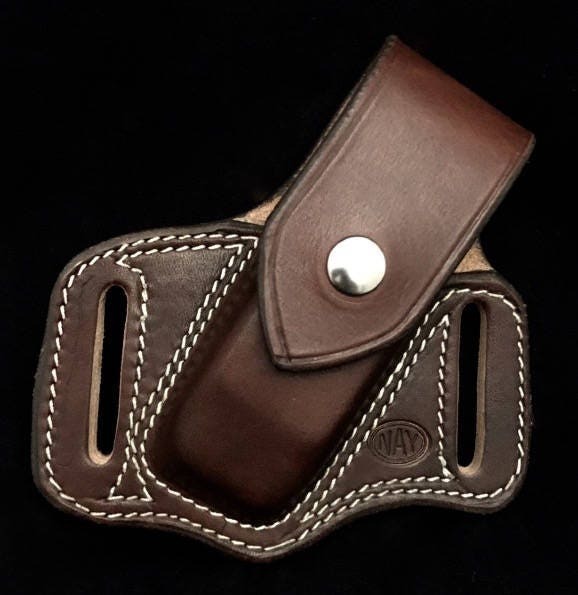 I have several other Nays holsters and like EVERY one before they knocked it out of the park with this one once again! Top quality, fit and finish are superb. Customized and fits perfectly! Thanks so much. Awesome craftsmanship! Highly recommended! "I don't see my tool in your dropdown box options. 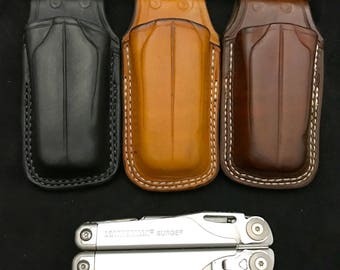 Can I get a sheath made for my tool?" Yes! We mold the leather right to the tool to make our sheaths. We have most Leatherman and Gerber tools on hand in the shop to mold it to. If we don't have your specific tool/knife, you have to send us yours to us so we can build it! Note with your order your tool/knife! "What is the best way to care for my leather item?" Most of the over the counter items are fine to use. The best way we have found is to clean with Murphy's Oil Soap and water, then condition with Nay's Leather Cream. It works very well and can make your sheath, belt or whatever leather item look as good as new! We make our own leather cream here in the shop that we sell on our Etsy store! Click the link to buy the cream for your leather care!